Distort Tour and ‘There Ain’t No Hope Baby’ explore my obsession with my Jewish roots in Nazi Germany and the town my family grew up in. This obsession, while in Berlin, ultimately consumed me and burdened me heavily, hindering my social behavior and overall state of being. 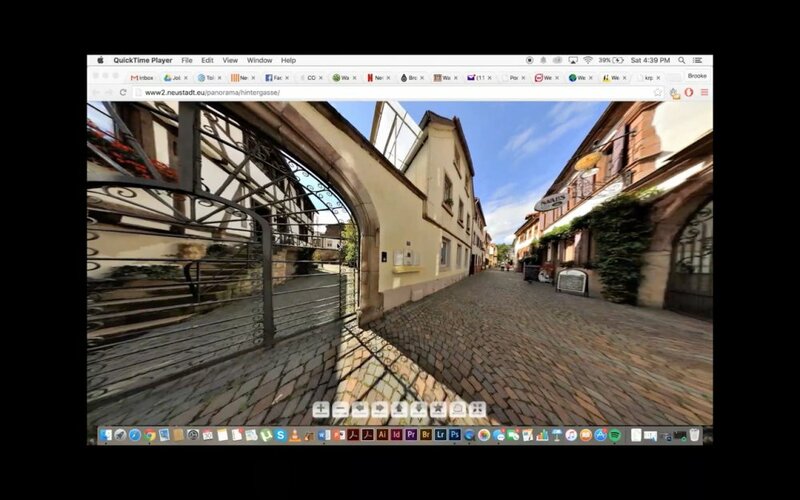 Distort Tour is a recording of my computer endlessly scrolling through appropriated video from a 360 ° tour of the town of Neustadt an der Weintraße, creating a distorted, looping effect. The imagery in the video represents the idyllic fantasy I had about the town, while the distortion represents the actuality of my experience. The endless looping of this façade speaks directly about my obsession and its negative effects on my well being. ‘There Ain’t No Hope Baby’ is a German toll-free hotline I created that the viewer was able to call while watching Distort Tour. The poster was drawn by Bobby Smith (PBSS16), and depicts a dream I had of my Grandfather standing in my doorway. The hotline directed the viewer to a three-minute recording of an interview of my Great Uncle speaking about his traumatic experience growing up in Nazi Germany. The hotline was only available to German residents and expired the day I left Berlin, signifying the closure I needed to receive before ending my experience in Germany.